itS mY LiFe !!!!!!... : A Rare Exclusive Interview ! Its 16th September again… Oh c’mon, don’t tell me you don’t remember… It’s my birthday today…. I am 2 years old today… taaaliyaaan!!!! Thank u thank u.... In this happening year, I have gained weight of 85 posts… cool na?? On this momentous occasion my creator - my father was exclusively interviewed by mother of my very good friend cuckoo.. read on….. Ya I know..my father is much less interesting than me..but hope you find it OK..
Good morning Mr Bedi. Before we start, let me Introduce my pet Tiger to you.. he's always hungry and let me put a few things a little straight to you. 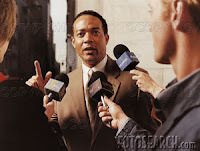 As you know I would be taking your interview, you have to remain seated calmly without questioning my questions or no. of questions. There are going to be five main questions with some sub-questions. Treat them as parts a, b, c etc. please be as detailed as possible, it'll give you some practice for your ongoing exams. And please keep your face a little more cheerful. It looks like you have come here for a mourning or is it that Parampara experience is still fresh ? I hope they've not beaten you black & blue. Yeah, that's a little better now. Keep smiling like that. You look good in that pose. So, shall we start ? 1. Well, Mr. Bedi you have been blogging since Sep 2005.. almost 2 years. What changes have you noticed in you in these 2 years ? You have 2 blogs, how much importance do you give to each one of them? Now that you have again started studying , do you think it'll have adverse effect on your blogging? How are you planning to manage ? You are posting very little on your second blog. What happened now? Have your thoughts stopped provoking you ? Well, change is the essence of life.. and without knowing we change a lot every moment, every day. 2 years is a long time and I myself cannot quantify the change in this long long time. How much of this can be attributed to the blog – well it is a medium to put in the thoughts.. and your thoughts to get modify if you write them. Sometimes it forces you to think positive, even if you are having negative mindset and that is the most important change one can have any time in life. Regarding 2 blogs – yes, I have not concentrated on the second one. Actually I had started it as a theme blog. During that time, lots of discussions used to take place between us roommates - KT, Akash, Vibhu, me – so just wanted to capture some of them and hence started the blog. With time everyone moved out and hence the motivation actually went away. Now I do have some plans to revive it after exams in a different manner. Lets see how far it shapes up. And studies do affect the blogging though I can say that it is not that bad till now…they have become smaller though. 2. Oh I am so sorry for throwing a bucket of water on you. I know you have a cute innocent face but that won't work on me. I told you not to pretend sleepy during interview. Now let us talk about your spiritual & political beliefs. What do you have to say on these? ... You are NOT supposed to copy my answers. And no one liner please. I know you have to complete a FinAcc assignment but that's not an excuse. Fin. accounting assignment – don’t worry, my roomie is doing it. I just need to copy it… Ok. About political beliefs – I believe in what was said in RDB and Nayak . Oh sorry… I think you have still not seen the movies. In short, I believe that blaming the politicians is not entirely correct. If you blame, you should be courageous enough to step into their shoes or at least so something towards that direction. I know it’s very easy to say and tough to do… but I think it is changing and it will change. As regards spiritual, I don’t believe in the concept of religion or praying to God. Jesus, guru nanak etc – they may have walked on this earth sometime in the ancient history. But they ended there and then. Their thoughts have carried on but considering them as God and praying them – I don’t believe in that…. But I do think there is some kind of unknown force present. It may be the unknown powers of our unexplored brain – not sure of it..
3. Well, Mr. Bedi. Ah, you have a pretty good short name. Can I call you SiD ? Oh thank you for obliging me. NO NO.. don't move. I understand it's quite hot in there sitting on that boiling pot. It is a matter of a few minutes if you co-operate nicely. Now describe your most embarrassing moment till date and also a moment when you felt like crying. Shoo.. shooo.. get this tiger away yaar… I feel uncomfortable in presence of animals… specially the species called tigers… thanks.. much better… already an embarrassing question and top of it your ‘protective’ tiger… haan.. what was the question.. embarrassing moment.. umm… umm… what comes to mind at this particular time can be the first project at infy.. I had an important delivery that day to be sent onsite.. first project… first big delivery.. there were some nerves running out there.. I composed a nice mail.. added everyone in ‘To’ and ‘CC’.. and pressed ‘ctrl+ enter’.. had quite recently learnt the outlook shortcut… ..got back to work… and for some purpose opened the sent items folder.. and realized that there was no attachment in the mail… damn it..... it was late evening. That means morning at US… and the PM could check the mail anytime… more nerves now… I copied pasted the mail in a fresh window… added a line.. sorry for not sending the attachment.. and again pressed ctrl+enter…The 3rd mail did have the attachment… my PL later said.. no problem.. happens… It never happened after that !!! 4. No, you can not remove that bright jazzy red T-shirt which Rompy gifted you last year and again telling you.. remain seated quietly. Don't try to show off your biceps/triceps to a girl. Arre haan wahi your dole/shole. My pet tiger is curiously looking at you and he has just had a bucketful of Vodka. He now wants to taste some non-veg. Well, the topic of friends has come up.. I can see you have written quite a lot posts about them. So would you please tell us what do friends mean to you ? Do you have any friend of school years whom you have lost touch with and would want to be with him/her now? What about blogger friends ? What ?? Me ? NO, no don't even look at me. Tiger !! come here & sit near this sweet fella. He is upto something I guess. Abbey hattt Tiger ke bacchee.. haan so what were you asking.. oh let me come sit near you. This tiger is growling a lot.. I can’t even hear you… ok.. this is much better.. so about friends…well friends are indeed very important for me…my core group of friends have been a great influence in my life.. I cherish every moment with them and when u are with them more than 8 hours every day for 4 years of your life.. you tend to have plenty of such moments.. hence the blogs.. regarding school friends.. orkut has played a big role in helping get in touch with many of them.. I don’t think there is any, with whom I have lost touch.. less frequency, I agree but not complete. just out of curiosity, how did u know that i had been gifted a red t-shirt??? it was not rompy though but some friends did gift me a red t-shirt before i came to mumbai.. But at the same time I just can not ignore this very important question. Tell me honestly why you opted to be interviewed ? We all need a good detailed answer with why not & why yes. Attempt all the four parts of this. a) Was it sheer habit of getting interviewed ? b) You had nothing to post about ? c) You wanted to find more about yourself ? d) You wanted to have my mail-id ? Hey, come on, spill the beans now. See, all your friends are chuckling there. Note-Your interview isn't complete yet. We'll sit for another round very soon. Those who are laughing at you, send them to me to be interviewed. I would like to extend a warm thanks to you for the 1st special interview I have had…hope u enjoyed it… I know u are mad at me not answering all questions… but some bahana should be there for our next rendezvous also.. ryt??? First of all, great questions and answers... And don't think that we didn't notice how you avoided Q5. I am all smiles. Thank you so much for doing this interview in the middle of your busy schedule. Well written answers SID. But I can see you have very conveniently avoided some questions.. not fair. You are already queued up for next interview & this time you can’t get away like this. Q5 will remain open for the next interview. If you continue with this habit, I am sure you'd leave questions in tomorrow's paper also. Kidding, Ok ? Don't worry, be comfortable. Hmmm.. So, all this was to get my mail-id.. I see, I see. @Fleiger: Don't be so happy. Remember, your interview is still pending and it is going to be in two parts of 5 questions each. @SiD: All the Best for your exams. @cuckoo: Thanks for the birthday and good luck wishes..
and must say great intuition!! @Cuckoo: But I can still laugh til the time comes... After all, once you stop laughing, what remains? Ohkay.. I wished and then read it... Good one... The Last bit was veru interesting... Waiting the next "Rendezvous"!!! good one yaar .. esp the tiger chemistry... well embarrassing incidents mein to main line laga sakta hun ... ab mujhe bhi lagta ahi ki meri destiny Ross (frm FRIENDS) jaisi honi hai .. I mean har jagah bechaare ka *** jaata hai .. (hey what's the decent substitute for that word)..
@anon: thanks.. would like to know the lack of life blogs you noticed!! How was the exam? And where's thenext part with the much awaited answer? @flieger: next part.. depends on cuckoo.. when she gets time to take the interview... exams are fine.. going on.. 5 down 5 left!! 5 down 5 left? Oye kake, mein "exam" waale exam ki baat kar raha tha, is exam ki nahi. an innovative way to presnt that, guddd interview ! all d best, bhai...ab jaldi se chak de fatte !